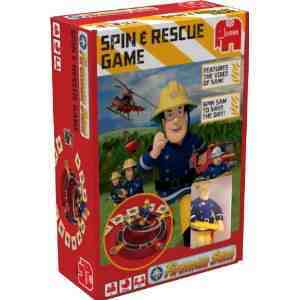 Big Tot loves cartoons, and has been trying out the Fireman Sam Spin and Rescue Memory game, from Jumbo, so, was it as popular as the TV show? As any parent will agree, games can be great sources for sneaky education- and this game falls into that category easily. Whilst The Tot Testers had fun with the spinning character, they also worked on their memory skills. The game is easy to assemble, taking under 3 minutes to put together. We had a similar game which had Peppa Pig as the spinner, but that was quite irritating as the pig often fell over, so this was a welcome change. It does require batteries which aren't included. Not only does the game improve a child's memory, it also promotes number skills, as the child has to make sure they have all 5 cards from a set to win. Problem solving is also included, as the child has to work out which cards go with which to form the set, they chose which character they want to collect at the start, and 5 cards will be associated with the specific character, for example, if playing as Fireman Sam, they will need to find his engine and other Fireman Sam character items. The toy has the added bonus of having the voices of Fireman Sam and Norman, which Big Tot immediately recognised, and for the age its aimed at, both of the Tots found it exciting. Little Tot had to be helped, at 3 that's no surprise and I found it quite enjoyable helping him to remember what cards he needed and where they were. Big Tot, however, worked it out pretty quickly, but this didn't stop her really enjoying the game, so boredom factor was low. This is a great fun game for younger children, and at under £10 its a great pocket money toy. 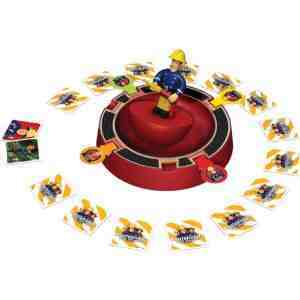 The Fireman Sam Spin and Rescue Memory Game is priced at £9.74, at Amazon.